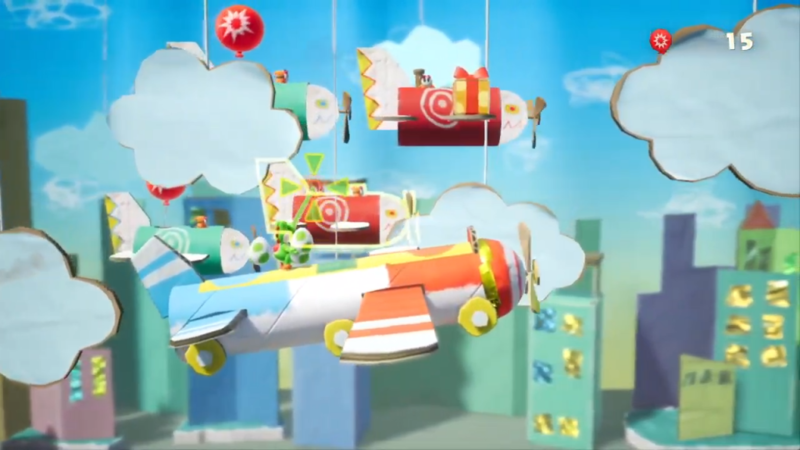 We were treated to Yoshi partaking in various activities — racing down a river à la rafting, harnessing the energy of solar cars and racing to the finish line, flying in a painted sky with planes, and operating a giant robot that would be a perfect papercraft model. Yes, we also saw a train, towards the end of the segment. The trifecta of planes, trains, and automobiles is complete! Besides vehicles to ride on/in, there are more than 180 costumes for you to collect and for Yoshi to flaunt. Other than being flashy or crafty, equipping an outfit will help when taking damages from enemies. We only saw a few clips of this in action, and the costumes are varied in terms of designs, items, and they come with a rarity system. Nintendo themed nods, like a Bullet Bill and Nintendo Labo Piano outfits, are present and mixed in with costumes ranging from food packing to animal cosplay. No word if any will be tied to amiibo or any of the old cosmetic patterns will be making the jump to Crafted World from Woolly World. Ready to chuck some eggs? You can pre-order Yoshi’s Crafted World on Amazon today!